When our young Naga students go out to study in mainland India or abroad, they feel the reality of how it is like being a “non-local”. Our experiences differ from sometimes being treated equally, discriminated or privileged. In Nagaland too, we have people from different parts of India living here and many others who have made Nagaland their home. A “non-local’s” experience is different from a natives, and they are often caught between two worlds. Yet, as we read below, a “non-local” is just as much a “local” in love with the land and people they can call “home”. Born and brought up in Nagaland, and living the life of a “non-local”. It is a statement resonating with many residents of Nagaland. The state is home to many non-Nagas or “non-locals”, as they are referred to in popular lingo. 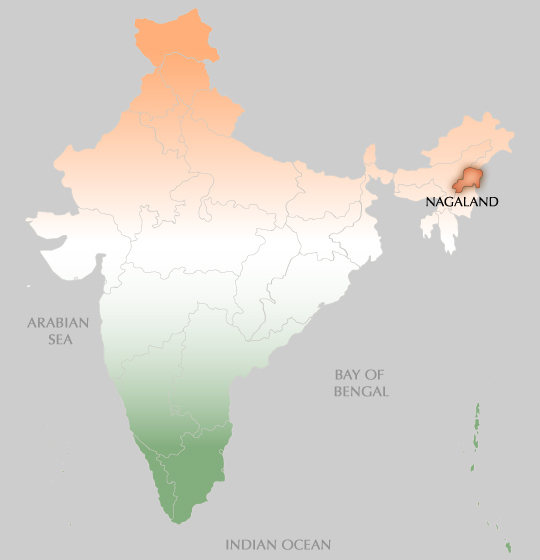 Nagaland became the 16thstate of the Republic of India in 1963. The fast growth of trade in the state has allowed several Mainland Indians to settle in different parts of Nagaland, with the concentration being in the commercial district of Dimapur. It is a fact that the economy of the state would be unrecognizable without these Mainland Indians setting their shops in the region. In the history that I have learnt, the Nagas always wanted a political union of their ancestral and native groups. This demand went unheeded by the Government of India, giving rise to violence in the state which continues to this day, and a buildup of hostility towards Mainland India. I am of a Mainland Indian origin. My parents were born and brought up in the coastal state of Orissa. They have been living in Nagaland since 1986 and have been contributing to the academic sphere of the state. I have been born and brought up here, which complicates my identity as an individual. I often face situations which compel me to question, where am I from? Am I a Mainland Indian who is foreign to this land? Or do I belong to this state? I term myself as a diasporic Indian living in Nagaland, facing a ‘neither here nor there’ situation. My family visits our relatives in Orissa once a year on an average, spending around 15 days together at the most. I have never been able to establish any emotional attachment towards Orissa. It’s not like I dislike my relatives, but to think of Orissa as my native land seems like such an alien concept. The first thing that comes to my mind when someone asks me “Where are you from?” is Dimapur. Yet the reality is that I am politically and constitutionally from Orissa. I cannot appear the exams for the government jobs in Nagaland, and neither can I in Orissa. While I can manage to speak rudimentary Oriya, I am a stranger to the script of the language. I can neither read nor write Oriya. This is a major issue that I face as a diasporic Indian. I once had to board a bus from Cuttack to Balasore, both districts in Orissa. There are route maps in Oriya in flashing neon lights around the bus. Naturally, I had to bear the judgmental looks of the conductor when I asked him in Oriya if this bus was going to Balasore. To him I looked literate, I believe, and perhaps he couldn’t comprehend why I wasn’t able to read the signs on the bus. My mother had attempted to teach me Oriya during one of my school summer vacations. As a child, I felt this was a complete waste of my time since I would not be using the Oriya script anywhere. As a grown up, I keep telling myself that I would teach myself the language from a self learning book, but it has never materialized. Perhaps on some level I still identify Oriya as a foreign language. While I was pursuing my higher studies in Bangalore, happiness would enthrall me on meeting a Naga. Bangalore, like any other metro city, has pockets of the Naga community blending amidst the façade of congested streets and high rent apartments. Those few moments spent talking in Nagamese would lighten my heart. I was a regular at the Zingron Restaurant located in Koramangala, owned by a Naga family. Savouring the bamboo shoot pork and king chilly chutney would remind me of ‘home’, my Nagaland which I so terribly missed. During my Masters, we had a paper titled ‘Indian Literature in English’. I was disgruntled to find that the paper included no fiction from Nagaland. I remember having a lengthy discussion with the teacher questioning the justification behind Indian Academia leaving out Naga Literature from formal education. As a teacher today I always encourage my students to read novels and poems by Naga writers. The myriad of my experiences will sound similar to all the ‘non-locals’ who have been born and brought up in Nagaland. There are times when we feel awkward and ashamed, like for instance when there was a surge of revulsion towards the Mainland Indian community on different social media in the days following the March 5 incident. I am certainly not implying that the Nagas are intolerant towards the Mainland Indians. When my mother had to undergo a surgery last year in Nikos Hospital and needed blood urgently, most of the donors who lined up were Nagas. The reason why I sometimes feel that I am a Naga by heart is because the Nagas I have come across have been so wonderfully accepting. For my parents, living away from their hometowns for decades has been possible only because of the love and support of the Nagas. Perhaps someday these lines dividing the children of God will vanish, and we will all be one in spirit. It is a fantasy yes, but when has reality been kinder?